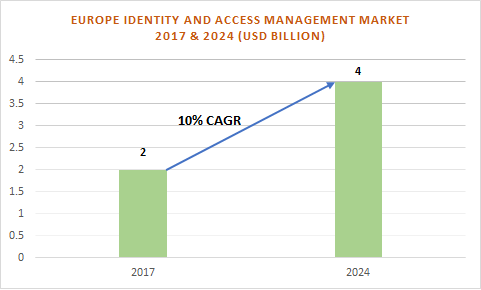 Europe Identity and Access Management (IAM) Market value in 2017 was projected to be over 2 billion and is anticipated to reach over USD 4 billion growing at a CAGR of over 10% over the forecast timespan. The major factors contributing to the growth of the IAM market in Europe include stringent government regulations such as the GDPR for imposing an improved safety of customers’ data. The growing popularity of BYOD and mobility trends have resulted in an enhanced demand for end-user device authentication, augmenting the market growth. As IAM solutions assist in aligning security policies and rules with business drivers, their demand is rising rapidly in the European market. The Single Sign On (SSO) solution is anticipated to grow at a CAGR of over 10% by 2024. It is a critical user facing feature in IAM systems and can connect users to multiple software applications at once. It assists in improving the user experience by allowing easy access with an enhanced security. It also enables the IT department to easily audit and consolidate user passwords and identities, thereby allowing them to identify, which users were compromised during a breach. IT & telecom is one of the fastest growing applications in the European IAM market and is projected to grow at a CAGR of over 12% by 2024. The telecom sector faces a large number of regulations due to which telecom operators are entering into strategic mergers & acquisitions with IAM providers to meet the regulatory & compliance laws and for controlling additional operational costs. In October 2015, TalkTalk, a telecom company based in the UK was attacked by hackers, leading to a breach of customers’ information including credit card and bank information. Owing to the telecom sector witnessing a large number of cyber breaches, it is essential for operators to adopt advanced IAM solutions, which will drive the market growth. Germany dominates the European IAM market and held a market share of around 30% in 2017. The country is a major target for cyber criminals with around two-thirds of the German manufacturers having faced a cyberattack resulting into loss of critical mobile phone data. As of September 2018, German manufacturers have lost around USD 50 billion due to cyberattacks, leading to a rise in the market demand. Companies operating in this country are also investing considerably in new product developments to deliver enhanced product offerings and augment customer services. For instance, in March 2017, Beta Systems presented its new IAM suite offering new functions and augmented orchestration of individual components, thereby meeting the rising requirements of their corporate customer base. The key players operating in this region are constantly upgrading their product & service offerings to deliver highly customized, compliant, and secure solutions to their customers. These companies include Beta Systems, Siemens, Accenture, Capgemini, Gemalto, iWelcome, Propentus, IBM Corporation, and Microsoft Corporation.